Who, and what, is The Picture Book Pusher? 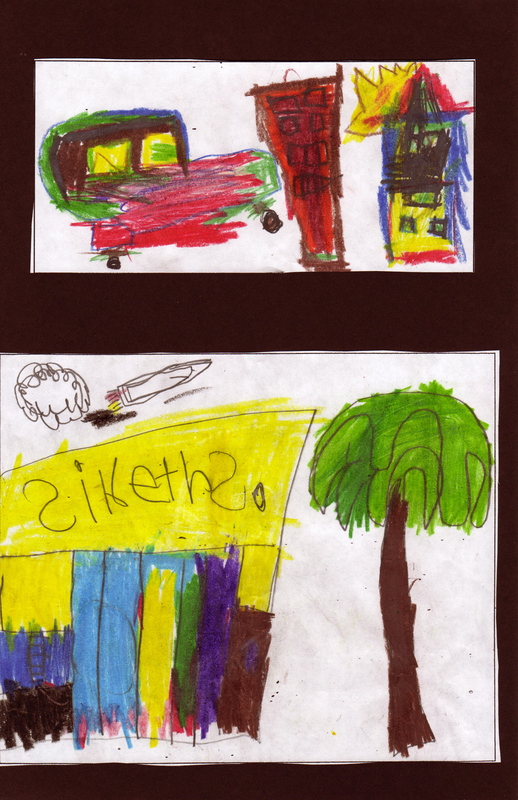 Original Artwork by 7 year old Keith Norris Jr.
I’ve never written a haiku. I have been known to write a high coo’, though. The month of May will soon be over. June welcomes our Poetry Unit, in my classroom. When choosing poems, for this unit, I am oh so selective. Time is precious, and so is the word. I do not call myself a poet. I cannot write poems, but I try, every once in a while, to write a poette strictly from the heart. Yesterday, as I sat at my classroom computer, preparing for our upcoming Poetry Unit, I jotted down (typed out) some quick words that came to mind. The format of the poetry folders, that I create for my students, is inspired by a mentor of mine, from 2008. A veteran, genuinely highly qualified, first-grade teacher, in an affluent town one mile outside the city. I was fortunate enough to complete my teaching practicum in her classroom. To this day, I emulate many of her teaching practices, but the content of our lessons does differ. We teach two entirely different demographics of students, even though we teach just 6 miles apart from each other. I choose the content of my lessons based on the needs, desires, and interests of my students. I pay attention to what sort of stories they engage most with, and the depth of their responses to those stories. Going through some of the old poems that I kept from my mentor’s classroom, I decided that these poems would not do justice to the needs of my current students. One strength I do know that I have, is scaffolding – a fine art, and vital quality to any teacher’s repertoire. The poems that I chose, this year, may seem deep to many, but they make sense to my students. And with the right scaffolding, they will empower my students. Listed below, are this year’s poems. It is not a complete list. I want to add more poems that describe our natural environment, and the seasons. Each poem is chosen from a book of poetry we have in the classroom – Children’s editions, complete with pictures of course. So this is the list, thus far. I like the simple, and eloquent style of Lee Bennet Hopkins’ poems for young children, in his book Alphathoughts, illustrated by Marla Baggetta. However, I no longer keep it on the shelf for my students to grab at their leisure, because the pictures are not relevant enough for my students. Everything, in my classroom must be relatable, and kind, to the lives of my students. Langston Hughes; please someone stop me before I only fill my students’ ears with words of Langston. Do you know how difficult it was for me to limit our selection to just four poems of Hughes? My students are already very familiar with his poem, My People. We performed it over the loud speaker for the entire school. It will be the first poem in their poetry folders. The last poem, in their folders, will most definitely be Things, by Eloise Greenfield. Eloise Greenfield is also a favorite of my students. 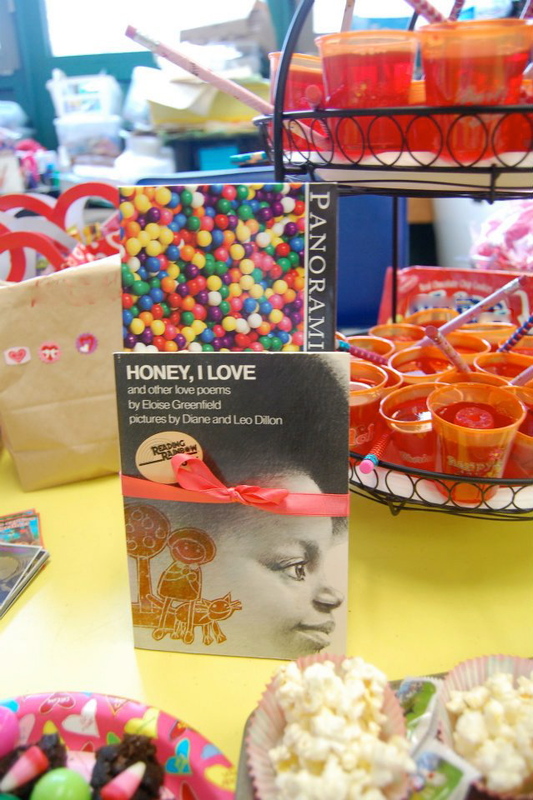 On Valentine’s Day, her book of verse for young children, Honey, I Love was a gift to my class, from me. Celebrating ‘Love’ is always welcomed in our classroom. Below is a snapshot from our Valentine’s Day classroom party. Another part of our June Poetry Unit, is inviting poets into the classroom. A couple months back, I met Mel King, long time activist and author, from Boston, Massachusetts. He gave me his number to call him to set up a time that he could come in my classroom, and read from his book of poems entitled, Streets. How grateful I will be, for his time with my students. 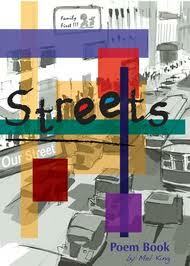 I picked up our classroom copy of, Streets, at my favorite bookstore in Roxbury, MA – Frugal Books: A Multicultural Bookstore. Below are some questions that you can discuss with students, before introducing a poem. The thoughtful, and relevant questions are taken from the website http://www.leeandlow.com. The discussion questions, that this website provides, are very similar to my own strategies in the classroom, however I wanted to promote this website because it does such a fine job of respecting valuable and relevant picture books. They provide teacher guides, for free online, so teachers may delve into a picture book in a more concrete and engaging way with their students. You can also purchase books from their site. Before introducing the book, share the background information with students. Then you may wish to explore one or more of the following questions with them. How would you honor someone you thought was really special? Who is your favorite writer? Has that writer influenced you in some way? How? What kinds of poetry do you enjoy? What is your favorite poem? Why do you like it? How do you show what you are feeling or thinking? Do you ever express yourself through art, stories, dance, or poems? How do these forms of expression help you communicate with others? Thank you for reading another blog post by The Picture Book Pusher. Write on.